Back in London today after a lovely time at Graeme's parents in Bedfordshire. The flat is freezing and I'm sure it's colder here than it was in Bromham! I'm glad I decided to take Christmas Eve off work, as it was enough of a struggle getting everything ready in time to meet Graeme after he finished work at lunchtime. We were up so late getting all the cooking done the night before, that I would never have managed to do all my packing as well before going to bed! It was nice to arrive in time for Graeme's Mum's "open house" without being all flustered. 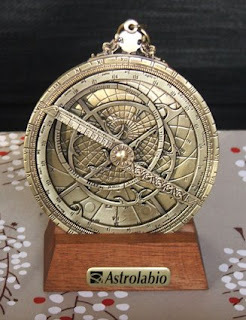 I got loads of nice presents on Christmas Day - the highlight being an astrolabe from Graeme. I adore old scientific instruments and had commented during a visit to Greenwich that I would love an astrolabe. The clever soul obviously started looking there and then! It really is beautiful and is functional. I just have to decipher the little booklet that came with it now! The rest of Christmas and the following days seemed to involve a lot of eating. Our culinary efforts with the starters were appreciated by all. They were uber tasty if I do say so myself! In between all those meals (just as well I lost weight during the wisdom teeth thing) we managed to fit in some lovely walks to Stowe Gardens and Ampthill. Stowe Gardens is amazing and I'd love to go back in the summer. So, all in all, I had a wonderful time over Christmas. Graeme's family were as lovely and accommodating as ever. I am sad that I didn't manage to spend time with my family over the festive period but hopefully we can find a solution in 2009! Christmas is so close I can taste it! Or at least I will be able to once I finish work this evening! Then it's off home to do a whole load of cooking to take with me when we go to Graeme's parents tomorrow. Graeme's Mum has learned how to delegate this year, so Graeme and I are doing starters for both Christmas Day and Boxing Day. We are planning on making little potato pancakes with smoked salmon and creme fraiche for Christmas Day, and Chantenay carrot and honey soup for Boxing Day. So tonight I am making the soup and the potato pancakes as they can easily be reheated on the day. 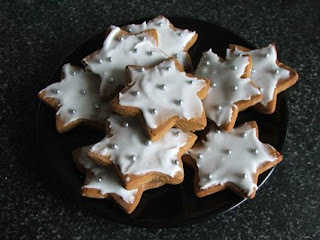 I'm also hoping to make some gingerbread cookies to take with me as well. On a different note entirely, Graeme and I went to see "Twilight" at the weekend. I read the book while I was recovering from my operation and thoroughly enjoyed it (it and season one of "Dexter" helped distract me from the pain). The film is good if you keep in mind it's aimed at teenage girls. Admittedly, some of the special effects are really lame and Robert Pattinson takes a bit of time to settle in to the role of Edward Cullen. I'm not entirely sure it was the kind of book that would ever make a good film but it was a decent effort. Feels a lot more like Christmas! Look at this chap! 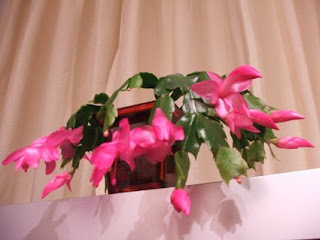 This is the Christmas Cactus that Graeme's Mum gave us two years ago. It refused to grow/flower/anything while we were in the old flat. Since we moved here it's gone crazy. We don't water it any more than we did previously, so it must just like this flat better (which is fine, because we do too). All those beautiful flowers! It does feel more like Christmas now. The tree is decorated and the living room looks nice and sparkly. I've got all my presents bought and tonight I'm writing my Christmas cards. I've also found the best chocolate yule log ever! I adore yule log and I spotted a ganache one in Waitrose at the weekend. So yummy. I might have to get another one this weekend - it's disappearing fast! I also signed up to start American Tribal Style bellydance classes after Christmas. I've really missed not dancing tribal since I moved here. The class is totally the wrong side of London for me but I think it's worth it. I'm excited about starting something fresh and that's got to be a good thing. I'm really keen to get a lot better at bellydance next year, so this is a good start. I've also booked a class with Sharon Kihara (my tribal fusion hero) during Tribal London in January. I've got slight angst about dancing with her but I've heard such good reviews of her workshops. Must remember to breathe! When will it feel like Christmas? I'm feeling hugely better now. The swelling is pretty much gone and my jaw is only slightly stiff. All in all, it wasn't as painful as I expected but it has taken longer for me to start feeling better. Last week disappeared in a haze of medication induced snoozling and I still cannot believe how much I slept. Thankfully, it all seems to be fine now, so it's back to work tomorrow! As a result of all this hospital malarky, Christmas seems to be passing me by. We don't even have any decorations up yet! It also looks like I won't be sending out any handmade cards, as Royal Mail lost the package that was bringing my card blanks. I've not been able to get out to buy some more, so it's shop bought this year it seems. Graeme will be home from his study group soon. Maybe we can get out the Christmas box and put up some tinsel tonight at least! My wisdom teeth are all gone. At home now recovering with the aid of many painkillers. Still feel a bit dopey after the anaesthetic, so it's back to bed now. Graeme and I have a little tradition of marking each Sunday in Advent with some festive tea and cake (any excuse really). After missing last Sunday due to our whistle-stop trip to Edinburgh, we made up for it this weekend! Last night was my bellydance class student hafla, which was good fun. I only danced in my classes group dance but that was nerve-wracking enough! Our music jumped twice during our performance giving us all a shock but like true professionals we got to the end (eventually). Today I've made a start on my Christmas cards. I'm still waiting on my card blanks but hopefully they will arrive soon. I'm off work from Tuesday as I'm having all my wisdom teeth removed, so I need something to do while I recover! OK, time to rescue the roast from the oven!